Closed since the 1940’s, The Emily Davison Lodge was reinstated by Olivia Plender and Hester Reeve in 2010 as a conceptual institution which produces collaborative artworks, exhibitions and hosts meetings inspired by the figure of the suffragette as a militant artist. 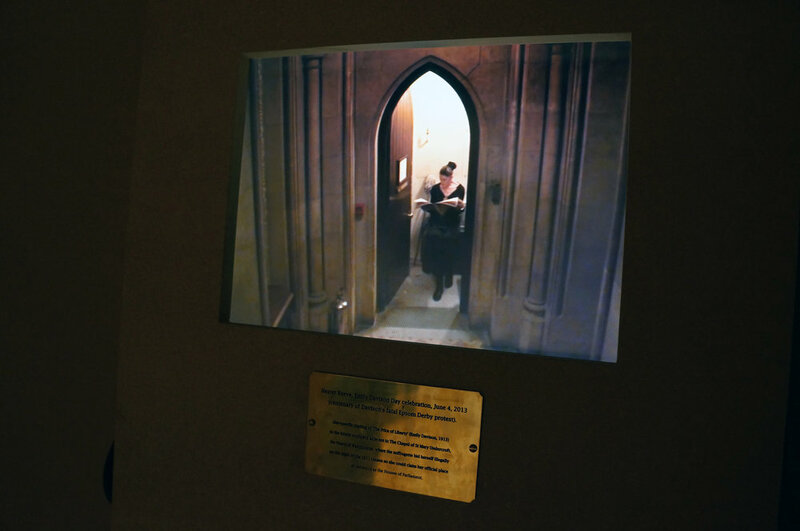 Includes documentation of live art action (2013) - reading out loud Emily Davison’s text ‘The price of Liberty’ in the broom cupboard in the Houses of Parliament where she hid overnight on the date of the 1911 census so she could consequently claim the House of Commons as her place of residence. (With special permission of Black Rod to mark the 100 year anniversary of the suffragette’s death at the Epsom Derby). This exhibition, curated alongside Emma Chambers, arose from the artwork 'Open Letter to Tate Britain' (see below) which expressed concern that the artistic contribution of leading suffragette Sylvia Pankhurst to the country's cultural and artistic heritage continued to be overlooked. The director, Penelope Curtis, invited Plender and Reeve to contribute an art work to establish the continuing agency of artists in stimulating debate and approaches to social change. The Emily Davison Lodge is grateful to the Pankhurst family for loaning most of the works on show. This image shows Sylvia Pankhurst's angel of freedom motif adorning a tea service that the WSPU sold to raise funds for their campaign, in the background are three paintings from the 1907 'Women Workers of England' series which were created to accompany her article under the same title publicising the harsh conditions and unequal pay that women faced in various industries. The exhibition included paintings, suffragette campaign materials (including the Holloway Broach - too tiny to see in the far box frame) and archive photographs. The Emily Davison Lodge's artwork, 'The Working Table of the Emily Davison Lodge 2o10-13' can be seen to the left below Sylvia Pankhurst's banner design for the West Ham branch of the WSPU. Installation shot of 'The Re-Inugoral Meeting of The Emily Davison Lodge 2010' (2 images) and also showing archive boxes of chapbooks for visitors to take away. 'Open Letter to Tate Britain' displayed alongside 'On a Pot Bank: Scouring and Stamping the Maker's Name on Biscuit China' by Sylvia Pankhurst, 1907 (part of the 'Women Workers of England' series, courtesy of the Women's Library). 'The Suffragette as Militant Artist' - chapbooks (mimicking the suffragette tactic of cheaply produced material given away to the public) containing research into the suffragette attacks on artworks, suffragette artists and proposing June 4th as Emily Davison Day.